Nexon M Inc is a famous game developer that creates addicting game, including Monster Squad APK 2.00.17294. It is available under role playing category. Up to 5 million users have already downloaded and played this exciting game. The graphics of this role-playing game is colorful and relatively decent. 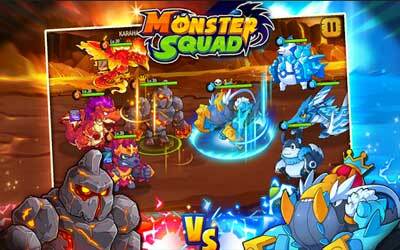 As the name implies, you need to collect monster and form a squad of strong monsters. Leveling system incorporates battle against various enemies along the journey of adventurous maps. More than 500 monsters are available on this role-playing game. Those monsters are design with cute and adorable figure. The gameplay is relatively simple. First, you will get starter monsters to begin your adventure. To collect other monster, you need to win a battle. The experience gained from the battle will improve your monster. At certain level, the monster will evolve into stronger monster. Each monster has their own statistic that shows how their strength is. Leveling and evolving the monster are the best way to make your squad becomes stronger. The monsters available in this game are categorized into four attributes including neutral, water, fire, and earth. Certain attribute is stronger against other attribute. You can choose build a squad consists of single or multiple attributes. The monsters have rating that determines both rarity and power they possess. This exciting role-playing game is linked to Google Play Games. Therefore, you can continue your adventure from other smartphone by login on the application. When you complete certain task on your adventure, you will get an achievement. Completing the achievement will give you rewards to help you continue your journey. This game also supports multiplayer feature. It allows you to fight against your friend squad. Monster Squad for Android is recommended for users who enjoy role-playing game with cute and adorable monsters. Embark on an exciting adventure with your Monster Squad all while battling various enemies along the way. Find and unlock new powerful monsters and journey with them across various dangerous, yet mystifying, islands! During your journeys amass an expansive collection of more than 500 monsters. Monsters have different attributes: Fire, Water, Earth, and Neutral. Boost your Monsters to power up your stats! Evolve or Fuse them to unlock new, exciting, stronger monsters. Take your Monsters to the Arena and go head-to-head against your friends! Earn weekly rewards and more all while claiming your place on the leaderboards. Mix and match Monsters to make the best team possible! Find the best combination of team effects and bonuses to ensure victory on the battlefield. Enjoy Monster Squad on tablets to enhance your experience with high quality graphics. Experience awesome skill effects and unique animations of your monster squad on bigger screen! Sort locked monsters to show up on top! Sell monsters immediately after acquiring them! Auto Repeat: Play through a field multiple times until energy runs out!